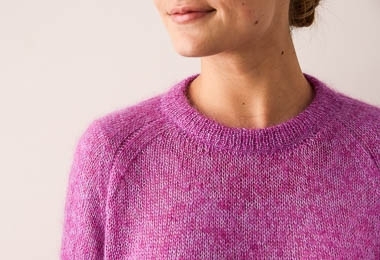 Our Hummingbird Pullover is named for its bright colors, feathery texture, and lightness of spirit! It knits in the round from the bottom up with raglan-shaped shoulders and a loose and roomy fit. Along the way you’ll find little thoughtful details: a split hem along the bottom ribbed edge, architectural shoulder decreases, and a neckline that folds under to the inside for a soft, rounded finish. Simple in construction and design, the Hummingbird Pullover really takes flight with our mohair-silk Tussock. A fine laceweight with substantial body and bloom, you’ll hold two strands of Tussock together for a downy, soft, and feather light fabric. Go all-in on one color, or like we did, choose two to create visual depth and a distinctive marle. Please click Product Details, above, for more information about materials, gauge, and sizing. Purl Soho’s Tussock, 60% super fine kid mohair and 40% silk. Each skein is approximately 328 yards/25 grams. Color A: 4 (4, 5, 5, 6, 6) skeins; approximately 1095 (1225, 1380, 1490, 1695, 1815) yards required. We used Alpine Phlox. Color B: 4 (4, 5, 5, 6, 6) skeins; approximately 1085 (1215, 1370, 1480, 1685, 1805) yards required. We used Bright Thistle.